I've done it all. I've commuted to one hospital for more than 10 years and worked at home as an employee of a major health care system. I've traveled the country for nearly 10 years as an auditor, consultant, and contractor. For the past 11 years, I've worked as a contractor from the comfort of my living room. What have I've learned? If you have the opportunity, self-discipline, tech savviness, and family support, remote is the way to go. It doesn't matter whether you're a clinical documentation specialist, coder, data analyst, or data abstractor. As long as you can access the EHR and any vital data-manipulating applications (such as an encoder or a collection tool), you're good to go … or stay, as the case may be. However, there are certain factors to keep in mind. You can't work from your dining room table—unless no one ever eats there. You need a dedicated desk, ergonomic seating, good lighting, space for a capacious filing system, decent supplies, and a drive or whole computer dedicated solely to work projects. A reliable printer, a webcam if you plan to video chat, and, depending on the position, a fax machine or scanner are suggested tools. You also must have high-speed internet, powerful antivirus protection, a dependable backup program, and some sort of virtual or physical firewall. If you're an employee, it's likely your employer will provide the necessary equipment. If you're self-employed or a contractor (essentially the same thing), equipment is an out-of-pocket expense that must be tracked meticulously for tax purposes. One of the best decisions I ever made was to employ a bookkeeper. If you are unable to simulate the hospital set-up, you shouldn't be working remotely. If you're not comfortable being your own in-house system administrator, consider receiving technology training before embarking on a remote career—or know who to call if necessary. An organized approach to maintaining paperwork and digital files is essential. Nothing is more embarrassing than being unable to locate an important report. Your family needs to take it seriously, too. When attending a virtual department meeting, it doesn't look good to have screaming toddlers or loud music booming in the background. Without childcare or children who are disciplined enough to leave you alone during office hours—and even then you must be flexible—working remotely is not recommended. Many a summer my children have ebbed and flowed about my work station like the tide, but they knew to write notes or ask quietly for whatever they needed and then to go about their business on their own until "closing time." You know whether your family will allow you to be undisturbed during work hours. Be honest about whether this is a step that can be taken now or in the future when the children have eclipsed a few key developmental stages. As for attire, some people work successfully in their pajamas. For me, the motto is "As above, so below; as without, so within." I wear business dress to my desk—not necessarily a suit or stockings, but it is an outfit I wouldn't be ashamed to video chat in. (No one needs to see my sneakers or bare feet, the one home luxury I take.) If they're part of the dress code at your organization, scrubs may be an excellent compromise. They'll keep you feeling comfortable but also professional. Religiously maintain any credentials and rack up those continuing education (CE) credits. With webinars and credits for reading online articles, it's much easier to accumulate CEs than it used to be. It's highly recommended that contractors purchase malpractice insurance. 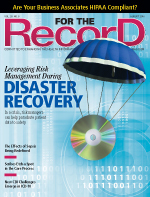 If you're subject to HIPAA oversight—and who isn't?—such insurance can be invaluable. If you're supposed to clock in and out on a Kronos or a similar online system, do so as punctually as you would if you were onsite. For those who log their own hours or are salaried, be just as precise with your time. When you're self-employed, it is all too easy to work 24/7. Determine your 40 hours (or whatever) per week and work those hours and only those hours. Give yourself the same flexibility that you would have if you were in the office. Occasional overtime is one thing; being dumped on is another. Part of maintaining a strict schedule includes being unavailable to drive kids around town, receive packages for neighbors, or do any of the other little chores people will think you can do because you're "at home." Be very clear with family, friends, and neighbors that you are truly at work; it just so happens that you're at home. On the other hand, one of the advantages of working at home is being able to rearrange your schedule to attend a school conference or deal with a family emergency should the nature of your work and your employer permit such a privilege. At the moment, I'm one of two people working remotely in an office of up to 20 staff. For many years, I was the only one offsite, so it was easy to be out of sight, out of mind. To avoid being "forgotten," request to be copied on all e-mail groups pertaining to your work. Don't hesitate to share interesting articles and news events with the folks in the office whether you work directly with them or not. However, keep in mind that while a New England Journal of Medicine article directly related to a work project is ripe for sharing, most Facebook memes are not. Send weekly status and progress reports to leadership; if appropriate, add a sentence or two about what's happening in your social life. People seek connection; it's human nature. Making yourself "real" to associates in the office will benefit you come review time. In that regard, visit the physical office as often as required or feasible. Despite living half the country away from "my" hospital, I make an annual pilgrimage to the office. However, there are remote workers who go onsite weekly. It's always a good idea to bring a little something—not so much that you appear ostentatious but enough to brighten the day (baked goods are always a hit). The advantages of working remotely are numerous. My stress level is miniscule compared with what it was when I was traveling or commuting. Besides my stress level, my gas bill also shrunk. In addition, I get to work with my pets sleeping at my feet. There are disadvantages, however. For example, I miss meeting friends in the hall and staying in the know by kibitzing in the cafeteria … but not enough to go back. — Julia Welch, CCS, who's currently working on her CPHQ, has been a transcriptionist, English as a second language teacher, abstractor, and data analyst. She's been a certified coding specialist since 1992.